I have made some major changes to the blogs I’m offering in March and I pdated this list to reflect those changes. These changes should make it easier to find information and give additional exposure to every one who submits information about their books and themselves. ANY published author is welcome to submit these questions and answers to promote their books. To use any of these blogs – click on the link, click on “how to submit” in the top corner of the blog and follow the instructions. I ask that you send the questions and answers as an RTF file. It is also good to send a jpg file of your book cover – no PDF files for the cover art. When you complete the interview, send to nikki_leigh22939@yahoo.com with the interview title in the subject line and I will add you to the list for that blog. I have divided the blog lists for fiction and non fiction books to make it easier to find the ones you need. I’ve added several new blogs lately – so if you’ve been here before – there are some new options. I offer a wide assortment of virtual book tour options and the current list is located at http://virtualblogtour.blogspot.com/2008/04/virtual-blog-tour-options.html and I offer virtual blog tours which coordinate and enhance Amazon Best Seller Campaigns – http://virtualblogtour.blogspot.com/2009/02/amazon-best-seller-virtual-blog-tour.html there are a number of options and price ranges and we can talk about other options. I’m planning to add more services in 2009. If you’d like to be added to my mailing list to get the latest updates, send me a message at nikki_leigh22939@yahoo.com. I am also adding a wide variety of social media marketing options to the things that Promo 101 Promotional Services offers. This is the full list of promotional blogs – the name, the blog link and the link to full instructions are listed for each individual interview. http://itsallinthesetting.blogspot.com/ – Details about story setting. If a movie was made about your book, which actors and actresses would play the main characters? This is your chance in case a movie of your book and it can be a lot of fun. Give potential readers more information about you and your background. Tell us about what you did before you were published and especially include anything that relates to your books and your writing. http://currenteventsinbooks.blogspot.com/- Can you tie a topic or element from your book with current events? This is the place to submit them. Send them to me and I’ll review them. http://judgebookbycover.blogspot.com/ – Share your book cover. http://currenteventsinbooks.blogspot.com/– Can you tie a topic or element from your book with current events? This is the place to submit them. Send them to me and I’ll review them. I reserve the right to refuse to post any submissions, but so far I haven’t needed to turn anyone away. I did edit a couple of first chapters to maintain a PG-13 rating for my visitors. That could be one of the reasons why some have such a long waiting list. All the blogs are listed on my Blogger profile which is located at – www.blogger.com/profile/00985309338453728557. I always thought I have a face for radio and now I get to prove it. Nikki Leigh has invited me to be a guest on her Blogtalk radio show and she will strive to answer my questions about Twitter. Come share Nikki’s pain as she attempts to educate a very non-techo author (that would be me) on one of the latest social networks available to all of us these days. See the review on Ash’s blog Tuesday. If you leave a comment on ANY of these blog posts during this Virtual Blog Tour, then your name will be entered into a drawing for a chance to win a “Lost Session” Interview CD, never-to-be-released; over 45 minutes long of Dan with Fred!!! You CANNOT purchase this ANYWHERE else! For the month of April, these are the blogs that will be visited by the new release of Dan Fogelberg’s Retrospective Interview 2-CD Set hosted by Fred Migliore of FM Odyssey fame! In May we will bring you the second book in actress, Julianne Moore‘s, Freckleface Strawberry series. This is Freckleface Strawberry and the Dodgeball Bully. We all knew that bully is school – he was big and mean and made most of the other kids miserable. In this book, Freckleface Strawberry is face to face with the school bully, Windy Pants Patrick, on a rainy morning. What will she do? How can her story help your children face bullies? 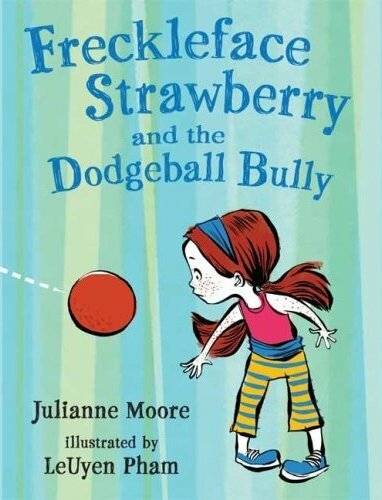 Acclaimed actress, and now beloved picture book author JULIANNE MOORE and bestselling illustrator LeUyen Pham join talents again for FRECKLEFACE STRAWBERRY AND THE DODGEBALL BULLY. This time, their perky, loveable seven-year-old encounters a bully on the playground—Windy Pants Patrick—during a game of dodgeball. As the brute prepares to hurl his might at Freckleface and her friends, she must figure out how to summon the courage to stand up to him. Ms. Moore tackles this all-to- prevalent problem with both humor and grace. It is Ms. Moore’s infusion of hilarity and heart that has won her praise from booksellers, educators, reviewers—and most importantly young readers!—for her debut picture book Freckleface Strawberry, a charming tale inspired by a childhood experience. Nicknamed Freckleface Strawberry when she a young girl, Ms. Moore disliked the title as much as she disliked her red hair and freckles. “As a child, my hatred of my freckles was only matched by my love of reading,” said the author, who eventually grew to tolerate her red hair and freckles and find amusement in telling her own kids about her childhood nickname. Dodgeball isn’t based on personal experience, but creating a feisty character who makes the best of a bad situation—and does so with style and wit—is essential to Ms. Moore. The Hours, Far from Heaven, The End of the Affair, and Boogie Nights. Ms Moore was born in Fayetteville, North Carolina, and earned her Bachelor of Fine Arts degree in acting from Boston University’s School of the Performing Arts. She now lives with her husband and children in New York City. Tuesday May 26 – Margay Leah Justice shares her Freckleface Strawberry review http://margayleahjustice.com/?p=263 . Its been interesting to see how this story is “transporting” the adults back to the tough times we all had in school. It is interesting how a story about a spunky little red headed girl and a bully. Stick with us during the tour and you will have plenty of chances to share your stories and to hear stories from other people who had a bully in their life. Monday June 15 – Stephanie shares her thoughts about Freckleface Strawberry and the Dodgeball Bully on her blog – http://thewrittenword.wordpress.com/2009/06/14/freckleface-strawberry-and-the-dodgeball-bully/. As an added bonus, she was able to meet Julianne Moore at BEA (Book Expo America) a couple of weeks ago and she shares the pictures she got of Julianne Moore. Are Celebrities Causing Twitter to Evolve or Devolve? You’ve no doubt been exposed to mass hoopla surrounding Twitter and celebrities starting Twitter accounts, racing to get the most followers, etc. There’s no question that celebrity Twitter use is good for expanding the social network’s user base, but what’s it doing to Twitter as a communication tool? Is Twitter evolving or devolving as a result of celebrities taking it over? (Tell us what you think. )You have celebrities like Ashton Kutcher, Jimmy Fallon, and Oprah who have gained massive amounts of followers, but are not following too many people themselves. Is Twitter just part of their respective PR machines? Are they actively engaging in conversations with their fans? Maybe a little, but how many of Kutcher’s million plus do you think are regularly getting responses from him when they send him tweets? Look at Oprah’s account. Granted, she’s only been on since Friday, but she’s already got nearly half a million followers and she’s only following ten people. So far she’s sent replies to Demi Moore, Shaq, Larry King, and Evan Williams. Hardly communicating with the fans I would say. To be fair, I’m not saying that there aren’t celebrities using Twitter who do communicate with their fan bases. Perhaps even Oprah will if given enough time. Some celebrities (like Arnold Schwarzenegger, MC Hammer, and Britney Spears have thousands of followers themselves (though who knows how many fans were manually followed back and how many were simply added as a result of some auto follower). I think Neville Hobson puts it well when he says Twitter is for listening. 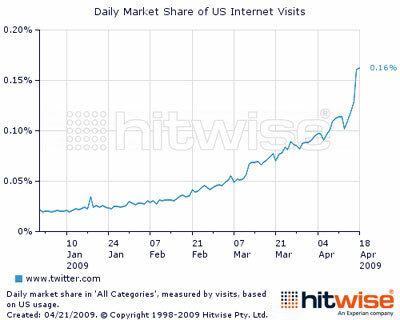 When Oprah joined Twitter, Twitter’s daily market share of Internet visits skyrocketed. Jason Miller discussed this at WebProNews. Oprah has a lot of fans, and they flocked to Twitter because they are interested in listening to what she has to say. Twitter the company is certainly happy to have celebrities participating. But if Twitter was once about two-way communication, it seems to be more about one-way listening now. Don’t get me wrong. Two-way communication is still an option, and there are still many people doing it, but some celebrities and marketers are changing the face of Twitter. Luckily, there is still value in listening. Twitter has often been referred to as microblogging, and that’s really a good way to look at it. You read blogs because you’re interested in what the bloggers have to say. You read tweets for the same reason. They’re just smaller. Blogs have comment areas for two-way communication that can go two-way or one-way depending on whether or not the author takes the time to respond. The same applies to Twitter. Don’t think of the increasing user numbers we keep hearing about as just so much more noise you have to filter out if you’re on Twitter yourself. Remember, Twitter is an opt-in idea: you decide whether or not to open an account and then who to follow or not. You’re in control! Instead, think of the stunning growth in people signing up to Twitter as more amazing listening opportunities to find out who’s saying what about you, your product, your brand, your client, or whatever it is that interests you in finding out what people are talking about online. I can tell you that a good place to find people in your niche to listen to is our own Twellow. Just don’t go too crazy because Twitter has placed a limit on how many people you can follow in a day (1,000). If you’re really there to listen, this probably will not affect you too much. There is a bit of a debate going on about whether this limit is a good or a bad thing too. Do you think celebrities are changing Twitter for the better or for the worse?